PATRON is pleased to announce our participation in EXPO CHICAGO 2017, featuring new work by São Paulo artist, Lucas Simões in collaboration with Marso Gallery in Mexico City. This presentation by Sao Paulo based artist Lucas Simões includes three separate bodies of work in dialogue. Dialogue, itself, serves as the stage and platform for Simões’ interests in exploring the functions of structures and systems and their inevitable failure and deterioration as an organic component in the life of their material contexts. Foundation is conventionally approached as a premeditated step towards permanence, Simões’ practice however looks at the information that can be gained from a recognition of the inherent instability of a foundation. Wether through the lens of his interests with Modernist Architectural history or the simple colorful nuances of communication, Simões’ work is a an exploration of balance. 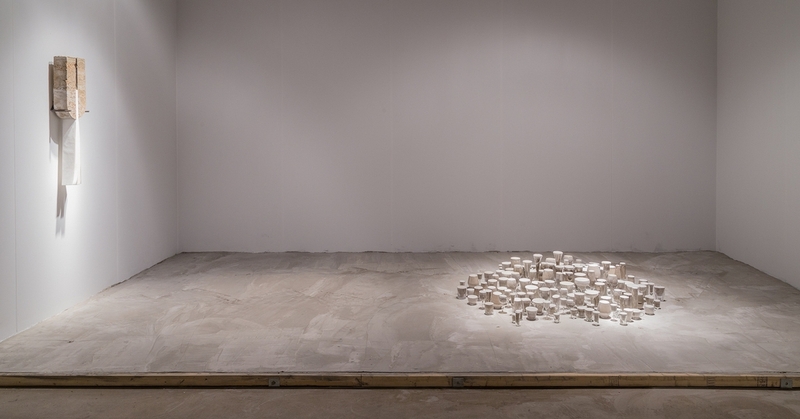 Perpetual Instability, (2014) is an installation composed of what at first seems to be a solid concrete floor, but which begins to crack and breakdown with every step that is taken upon it. The work presents the illusion of the ideal, in this case the perfectly smooth and solid foundation of a concrete floor. Ideally the floor is impeccably finished and will support the weight brought upon it with the strength that is conventionally attributed to concrete. However as steps are taken upon the smooth floor it is altered, step by step, until the entire landscape of its initial concept has been transformed. It can no longer ever revert back to the initial ideal presented in the beginning and exists as a very physical new reality. This work stems from Simões’ interest in architectural history, the instabilities of the ideals that architecture has promised from the development of certain movements in city’s such as Sao Paulo and Mexico City. What these urban landscapes show is a collection of attempts at the development of infrastructures with sifted promises, the shift being a natural component of the way things develop ultimately. Resting directly on Perpetual Instability’s surface is BEBADOSAMBA. BEBADOSAMBA is a sculpture composed of various distinct cocktail glasses filled to the brim with concrete. The work sits leveled and stable amongst the deteriorated floor around it. This work stems from Simões’ interest in the act of conversation, in particular the conversations that take place under the influence from libations. Exploring the delicate balance of informational exchange that takes place between individuals, BEBADOSAMBA is an inquiry into how conversation feeds its participants with one an other, the balance of exchange as a means of building. On the walls there are two works from Simões’ abismo series. The works are systems of materials which depend on one another to hold their shapes through a series of delicate balances. The paper components serve as a strong hold for the concrete component, leveling the materials’ importance in the overall sustain of the structure.